The Joint Emergency Services Interoperability Programme (JESIP) will be returning to the Emergency Response Zone to talk to visitors about its plans to support the work of emergency responders through working together more effectively. Fire and rescue services seeking greater collaboration with the UK’s ambulance trusts will find many stands of interest in this networking area, including the Independent Ambulance Association, Ambulance Service Institute, Association of Ambulance Chief Executives, East of England Ambulance Service, British Association of Immediate Care, London Ambulance Service, London Ambulance Service Cycle Response Unit, Association of Air Ambulances, College of Paramedics and Army Medical Services. Meanwhile the dedicated Search and Rescue Zone brings together RNLI, Maritime & Coast Guard Agency, Cave and Mountain Rescue, RAF Search and Rescue, Association of Lowland Search and Rescue, and Mountain Bike Search and Rescue, among others. Police organisations available to speak to will include National Association of Police Fleet Managers, and the Home Office CAST-AES, which provides technical guidance, advice and support to the police service with respect to vehicles and equipment procurement. Other government departments exhibiting in the Emergency Response Zone include the Environment Agency and the Highways Agency, while charities include the The Blue Lamp Foundation which provides emergency financial aid to help emergency service personnel injured in the line of duty. • Babcock - find out more about its two custom-designed training centres. • The Serco Combined Resilience Team – which brings together the International Fire Training Centre, the Emergency Planning College and Gold Standard Exercising. • Devon & Somerset Fire & Rescue Service Training Academy – which supplies firefighters from fire and rescue services, as well as international and commercial clients, with fire behaviour and specialist rescue instruction. • The NHS Ambulance Service First Aid Training consortia (NASFAT) - a partnership of NHS Ambulance Services that are working together to promote a full range of high quality First Aid Training Services locally and nationally. By bringing together over 300 suppliers to the industry with more than 5,000 emergency services personnel, the Emergency Services Show plays a vital role in facilitating the sharing of knowledge and best practice. It provides a single reference point for procurement personnel to access to the full range of products available from fire fighting equipment and vehicles and fleet to protective clothing, uniforms and medical supplies. Touted by aerial appliance experts and enthusiasts as revolutionary, the new Metz articulated turntable ladder will make its UK debut at the Emergency Services Show. The new technology has undergone a rigid patenting process and features many new benefits that visitors will be able to see for themselves. The Road Haulage Association is once again organising the popular Recovery Demonstration and Derbyshire Fire and Rescue Service will be showcasing The Ex-Tractor, an HGV “transformer” designed to demonstrate the nationally-adopted six phase HGV rescue approach. 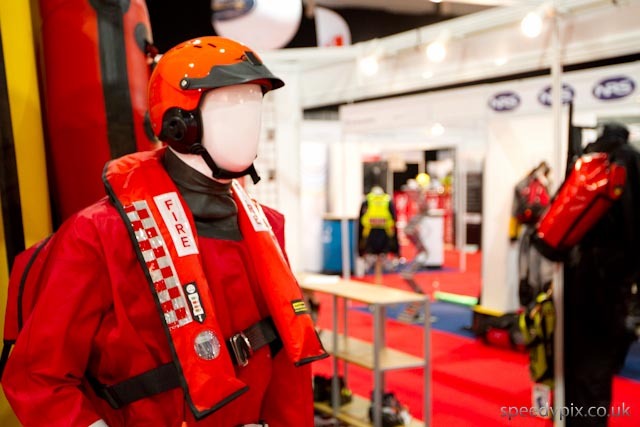 Meanwhile SARbot UK Underwater Rescue, Norfolk Fire & Rescue, and West Midlands FRS will be running exciting demonstrations of water rescue in the Pendigo Lake at the NEC and Thermal imaging demonstrations will be provided by Argus Thermal Imaging distributed by Vimpex.